Since early 2013, I have been able to handle a group of superb Canadian gold coins obtained directly from the Royal Canadian Mint (RCM). The coins in my group were among the first distributed by the RCM and also the first submitted to PCGS for certification. 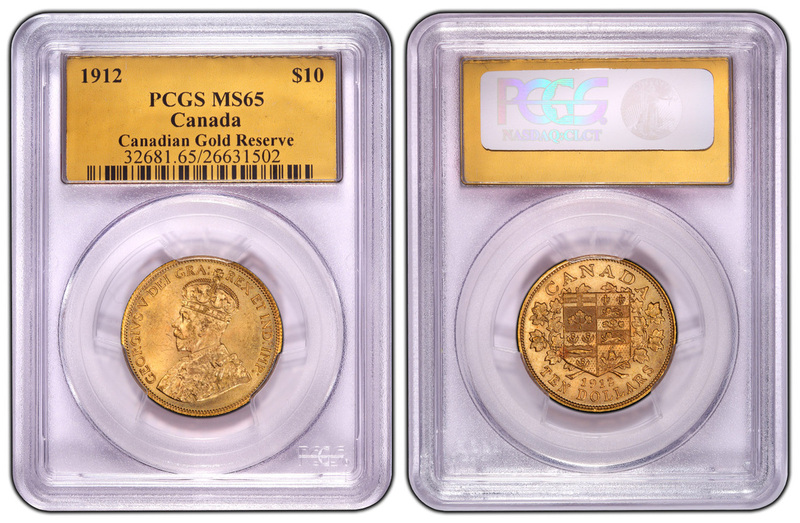 Therefore, they do not have the multi-color label used on subsequent coins, but instead feature the gold foil label with "Canadian Gold Reserve" boldly listed on the front to note that the coin in the holder is from this very special group offered by the RCM. The coins generally have superb reverses and both obverse and reverse have subtle rings of deeper gold along the rims where the coins show their age beautifully. If you ever wanted a coin imbued with interesting history, with great elegance and beauty, produced with flawless execution, made from Canadian gold and representing Canada through-and-through then these wonderful, scarce coins may be exactly the items to obtain. These coins are also the quintessential example of original gold coinage that has sat undisturbed for approximately a century and has never been dipped, wiped, exposed to putty or otherwise abused. That is, they are fabulous examples of what original skin gold should and can look like and, as such, they are great teaching tools for the numismatist. I have traditionally offered these at little above their gold bullion value, but to many they are so much more than gold bullion. The slab images on this page, immediately below, are stock images provided by PCGS to show the gold foil insert and this is followed by the text from the RCM regarding release of these coins. Please note that any coins offered by me represent the pooled purchases of several dealers and that only the highest graded coins have been chosen to list on my site. Therefore, these coins should be, on average, significantly nicer than the typical coin offered by the RCM. "The Canadian Branch of Britain's Royal Mint opened in Ottawa in January 1908 for the purpose of producing Canada's circulation coinage, as well as to finally refine Canada's growing gold resources on domestic soil for conversion in to Canadian dollar-denominated coins. This part of the Mint's mandate was realized from 1912 to 1914, when $5 and $10 gold coins proudly displaying national symbols were produced in the same Ottawa facility where the Royal Canadian Mint continues to refine and produce world-class gold coins and investment products. Made of 90% pure Canadian gold, much of it from the Klondike region (1912) and Ontario (1913-1914), and 10% copper, the reverse side of these first Canadian gold coins featured the inscription "CANADA" above a shield bearing the Arms of the Dominion of Canada in a wreath of maple leaves, beneath which appeared their year of issue and face value. The obverse bore the effigy of the newly crowned Sovereign King George V.
Our short-lived experience with a domestic gold currency was abruptly ended by the outbreak of the First World War in 1914 as the Government of Canada recovered the majority of circulating $5 and $10 coins and withheld remaining stocks from circulation to help finance the war effort. Struck 100 years ago, and sealed for more than 75 years in the vaults at the Bank of Canada, a rare collection of the first truly Canadian gold coins have now returned home to the Royal Canadian Mint. Approximately 245,000 King George V $5 and $10 gold coins dated 1912, 1913 or 1914 are currently held in the Exchange Fund Account (EFA), controlled by the Minister of Finance. To liquidate these physical assets and convert them into high credit quality, marketable fixed income securities, 30,000 of these coins were hand-selected for sale as high-quality treasures of Canada's numismatic past. The remaining coins bearing imperfections from handling or environmental conditions will be melted and refined into pure gold by the Mint, which will convert them into a tradable, liquid asset."